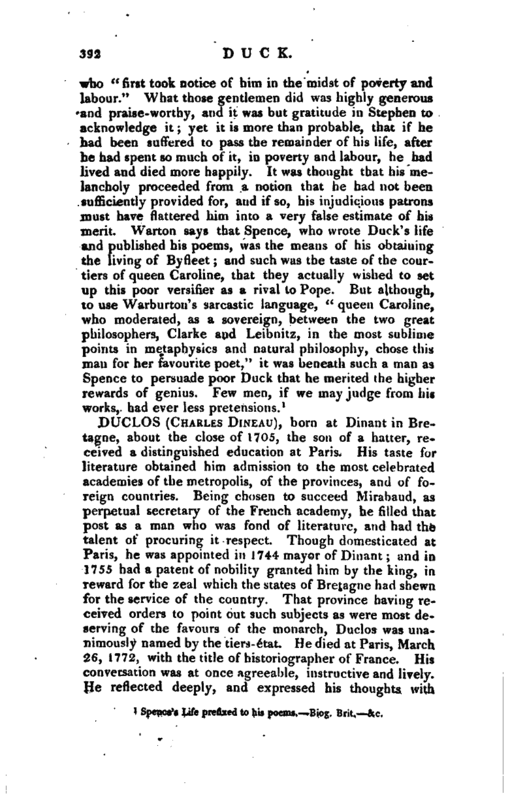 , a very extraordinary person, who from a thresher became a poet, and was afterwards advanced to the cure of a parish, was born about the beginning of the last century, and had originally no other teaching than what enabled him to read and write English: and, as arithmetic is generally joined with this degree of learning, he had a little share of that too. 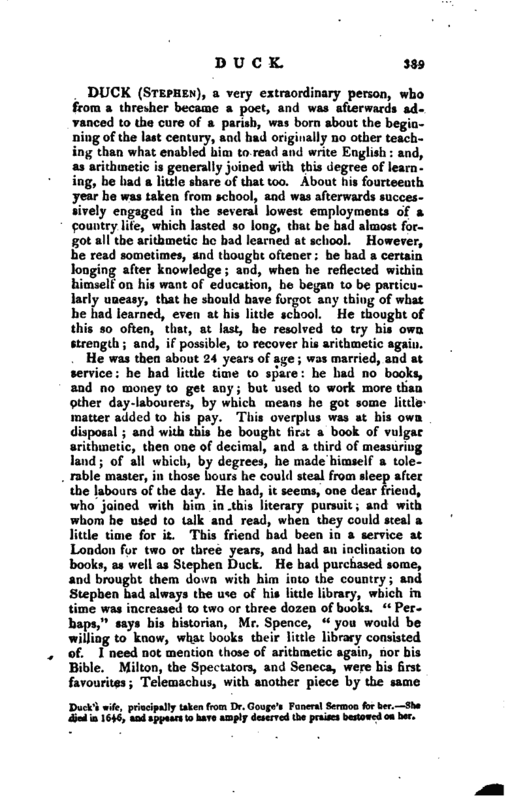 About his fourteenth year he was taken from school, and was afterwards successively engaged in the several lowest employments of a country life, which lasted so long, that he had almost forgot all the arithmetic he had learned at school. However, he read sometimes, and thought oftener: he had a certain longing after knowledge; and, when he reflected within himself on his want of education, he began to be particularly uneasy, that he should have forgot any thing of what he had learned, even at his little school. He thought of this so often, that, at last, he resolved to try his own strength; and, if possible, to recover his arithmetic again. 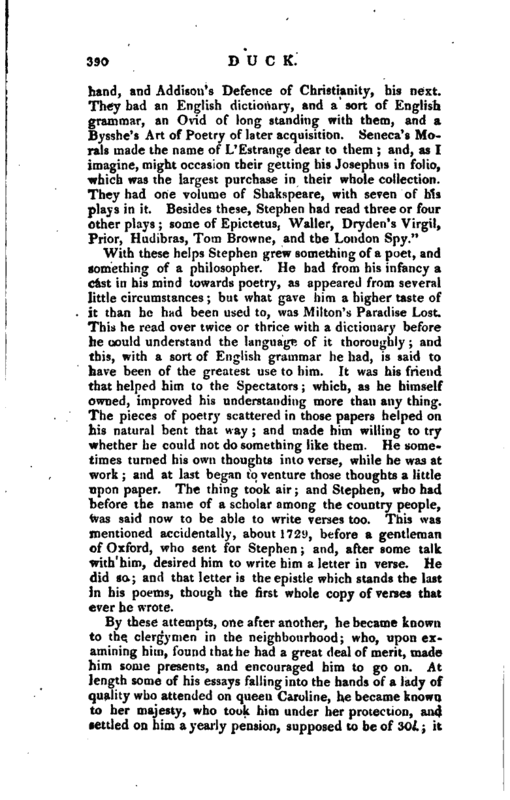 With these helps Stephen grew something of a poet, and something of a philosopher. He had from his infancy a cast in his mind towards poetry, as appeared from several little circumstances; but what gave him a higher taste of it than he had been used to, was Milton’s Paradise Lost. This he read over twice or thrice with a dictionary before he could understand the language of it thoroughly; and this, with a sort of English grammar he had, is said to have been of the greatest use to him. It was his friend that helped him to the Spectators; which, as he himself owned, improved his understanding more than any thing. The pieces of poetry scattered in those papers helped on his natural bent that way; and made him willing to try whether he could not do something like them. He sometimes turned his own thoughts into verse, while he was at wo;k and at la>-t bo;,an to venture those thoughts a little upon paper. The thing took air; and Stephen, who had before the name of a scholar among the country people, was said now to be able to write verses too. 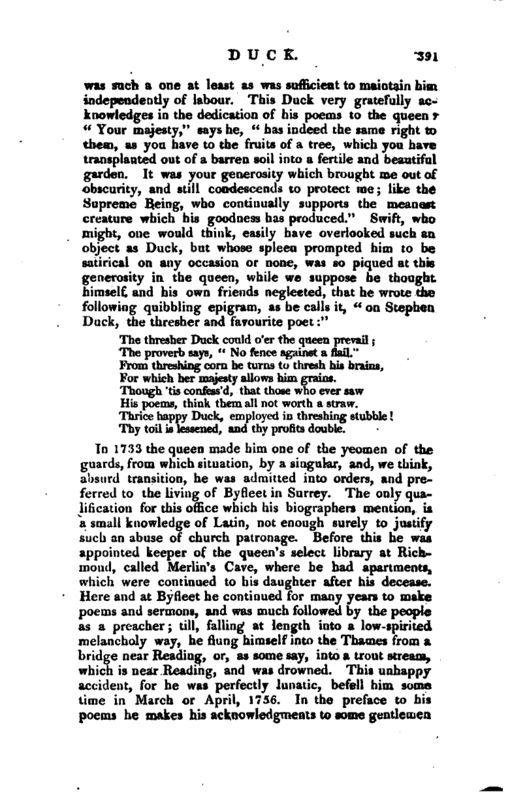 This was mentioned accidentally, about 1729, before a gentleman of Oxford, who sent for Stephen and, after some talk with him, desired him to write him a letter in verse. He did so; and that letter is the epistle which stands the last in his poems, though the first whole copy of verses that ever he wrote. For which her majesty allows him grains. His poems, think them all not worth a straw. Thy toil is lessened, and thy profits double. Spence’s Life prefixed to his poems. Bipg. Brit. &c.